A villa by the sea with 2 indepedent apartments sleeping up to 8 people. The villa is situated in an 4000 s.m olive grove by the sea.The 50 sq. m ground floor apartment (Danae) is composed of a twin bed bedroom, a lounge with 2 bed-sofas (sleeping 2 children) ,a bathroom and a communicating dining room-kitchen area en suite.It leads to a 40 sq. m veranda overlooking the sea. The first floor 100 sq. m apartment (Tatiana) consists of a double bedded master bedroom, with communicating bathroom, opening to a 16sq. m veranda, a 2nd twin-bedded bedroom with own bathroom, a 3rd smaller bedroom, a large lounge with a veranda, and a kitchen area en suite.The apartment leads to an open 50 sq. m barbecue area with oven and grill and a breathtaking view of the sea below.Both apartments are fully furnished with all necessary kitchen appliances, dish ware and cutlery. A 50 m stoned paved path leads to the exclusive crystal clear pebble beach. I am a retired medical doctor living in Athens and the property in Alonnisos is my summer house. Because. of its private beach and breath taking view. All modern facilities provided making ideal for family holidays and water sports. Location, beach, facilities, view and peaceful, quiet surroundings..
Central heating if necessary with extra charge. Full set of linen provided. Large enough for 2 cars. 2 refrigerators one for each apartment. Ovens incorporated into each cooker and outdoors barbecue. For percolated coffe one machine in each apartment and one espresso machine in first floor apartment. Ground floor cooker working on gas. First floor cooker on electricity. 3 dining areas with corresponding tables and chairs. One in the first floor veranda One in the barbecue area One in the ground floor veranda. One dining room indoors for each apartment. loudspeakers provided for mobile, tablet or laptop input. Radio and players in each apartment. Linen changed twice a week The DANAE lounge accommodates up to 6 people. The TATIANA lounge accommodates up to 8 The DANAE kitchen equipped with gas stove and refrigerator The TATIANA kitchen equipped with electric stove, fridge, dish washer and washing machine. The DANAE lounge equipped with radio and TV The TATIANA lounge equipped with satellite T.V ,DVD player and Stereo. This house in Alonissos is the perfect place for relaxing holidays. The house is located in an ideal place above the sea, without neighbours while not being isolated. The house is fully equipped with high quality furniture and equipment. It is very clean and comfortable. The view to the sea and neighbouring island is stunning. The sea and beach below the house were the best place we have seen for snorkling. The owner was very keen to do his best to make our stay relaxing and enjoyable. In short, this is definitely a place to recommend. The House is extremely nice, very well maintained and Costas is a dedicated and welcoming owner. The House which consists of two independent apartments hosts easily two families (8 guests altogether). It is very well equipped, beautifully designed and has a stunning view that you can enjoy from several terrasses. A small private beach gives access to a beautiful sea. A car (or scooter) is required as the house is relatively isolated. Happy to continue the efforts to upgrade services to my guests. 5 star reviews is obviously a welcome reward. We stayed in Villa Marina (2 families in 2 different and well furnished apartments). We really enjoied it! The house has everything you need, is comfortable and spacious and has a breathtaking view of the sea. 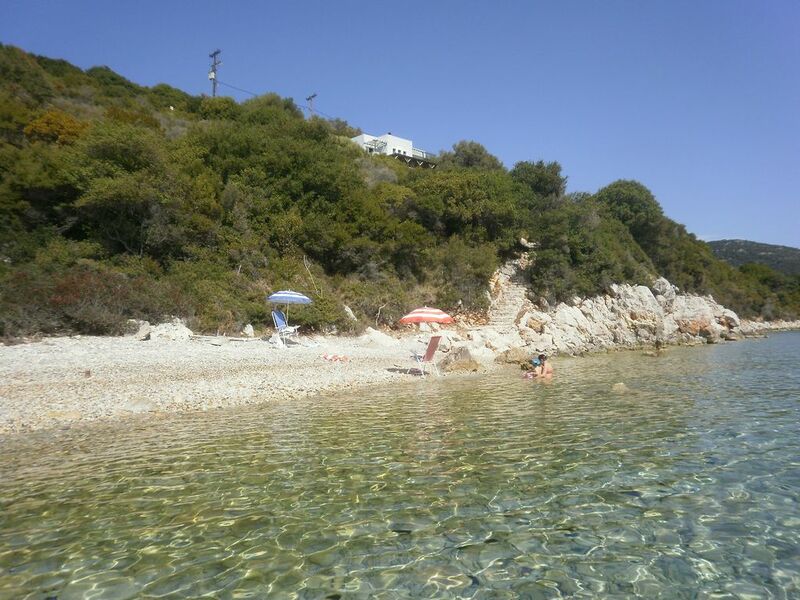 The most beautiful beach of the island (Agios Dimitrios) is within walking distance (few minutes) or swimming (less than 10 min. with fins). Costas, the owner, is kind, caring and considerate. The private pebble beach below the villa has a wonderful sea bottom. We cooked on the bbq and ate several times on the terrace overlooking the sea. Exceptional!! Recommend it to everyone. Abbiamo trascorso due settimane presso la villa. La descrizione corrisponde perfettamente alla realtà della casa. La cucina è attrezzata di tutto così come i bagni e le camere. La villa dispone di due splendide terrazze dove consumare pranzi e cene godendo di una vista eccezionale. Facilmente accessibile la piccola spiaggia bagnata da un mare di un verde intenso dove nuotare e fare snorkeling. Abbiamo avuto il piacere di conoscere Costas, il proprietario, persona squisita e premurosa che ha reso la nostra vacanza indimenticabile. Villa de rêve. Localisation exceptionnelle, au cœur d'une oliveraie et au-dessus d'une petite plage privée aux eaux cristallines et chaudes. Maison très agréable et très bien aménagée. Costas, le propriétaire, est extrêmement sympathique et disponible. Nous reviendrons des que possible et recommandons sans hésiter ! Transport to the island of Alonnisos is possible through 3 different routes.